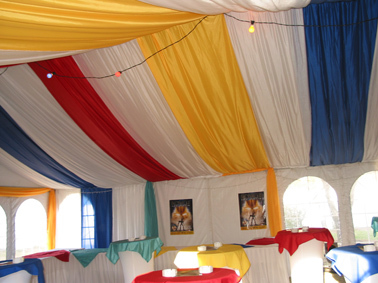 We could make your function extra special by draping your tent in a variety of styles and colours. It is with great joy that Act 1 Rentals promote this service. Give Act 1 Rentals the opportunity to transform your function venue or structure. Our in-house draping services are conducted through experienced drapers and a professional look is guaranteed. Black, Red and White Draping. Your wedding day has to be one of the most important and memorable days of your life. We have many years' experience with numerous outdoor weddings and we can help with wedding reception ideas. We aim to reduce the stress and increase the enjoyment. Our priority for a corporate event is first to establish your needs in early discussions. Then we deliver the marquee, furniture & epuipment you want on time, on budget and without fuss. Act 1 Rentals will be happy to discuss your requirements and offer our comprehensive expertise and service to ensure your event is etched in your memory forever! Marquees are perfect venues for hosting a party, they provide flexibility for you to host the party at the venue of your choice, any size of party can be catered for. 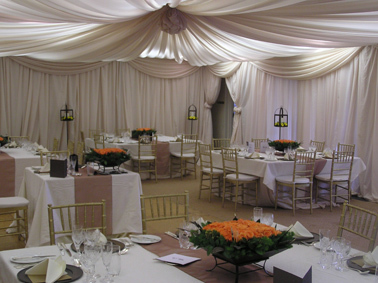 Marquee hire is perfect too for a themed party as they offer a blank canvas to let your imagination and ideas flow. ACT1 exceeds our clients expectations and raises the bar in event décor and themed functions. We know that it can be quite a challenge to get all your desired function elements together. This is why we are here, to make your life simple, by being your ONE-STOP FUNCTION & PARTY EQUIPMENT HIRE SPECIALISTS!